Advantages: Bi-lingual text; plenty of photos; excellent coverage of the Hetzer and its interesting camouflage schemes; includes 47 full colour and 80 black and white walkaround photos plus 12 colour profiles each with a small reference photo and markings supplied for all 12 profile subjects; good text introduction by George Parada..
Prolific Polish publishers Kagero has released a new volume on the German Jagdpanzer Hetzer , including coverage of the post-war G-13 in Swiss service. This vehicle was based on a widened chassis of the old Panzerkampfwagen 38(t), with wider roadwheels and a totally new engine, hull and armament. Despite the older heritage of its running gear, the new vehicle was considered to be one of the most successful tank destroyers of WWII, as it was fast, cheap and hard-hitting. Its low profile and heavily sloped armour also made it a difficult target. However, it was not all good news, as crews found the vehicle cramped and a difficult work environment with poor visibility. Kagero's new book on the Hetzer by Mike Koenig and George Parada is a very helpful package for modellers. Following George Parada's brief description of the genesis and development of the vehicle, we are treated with 47 full-colour walkaround photos and a furteher 80 photos in black and white. These photos are captioned in both English and Polish, and cover the whole vehicle from front to back, interior and exterior. 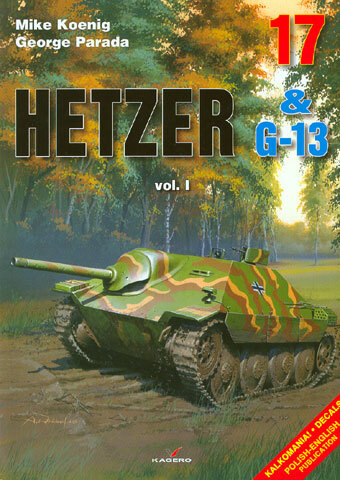 The Hetzer featured a range of unique colour schemes and these are nicely represented in 12 colour profiles. Each profile is accompanied by a wartime reference photo of the vehicle, although it would have been nice to have larger reproduction of these photos. With its wealth of great colour walkaround photos, profiles and decals, Kagero's "Hetzer & G-13" book will be a very useful resource to all modellers of German armour.